We’ll see Google cars on the road a lot sooner than expected — they just won’t be driving themselves. Google unveiled Android Auto on Wednesday, a new version of the company’s operating system built specifically for car dashboard displays. The new software links to the driver’s Android device, then uses the dashboard monitor as an interface for drivers and passengers to operate familiar apps and features such as Maps, Spotify, and voice calls. The driver can control the screen using touch; there’s also a voice recognition button on the car’s steering wheel. 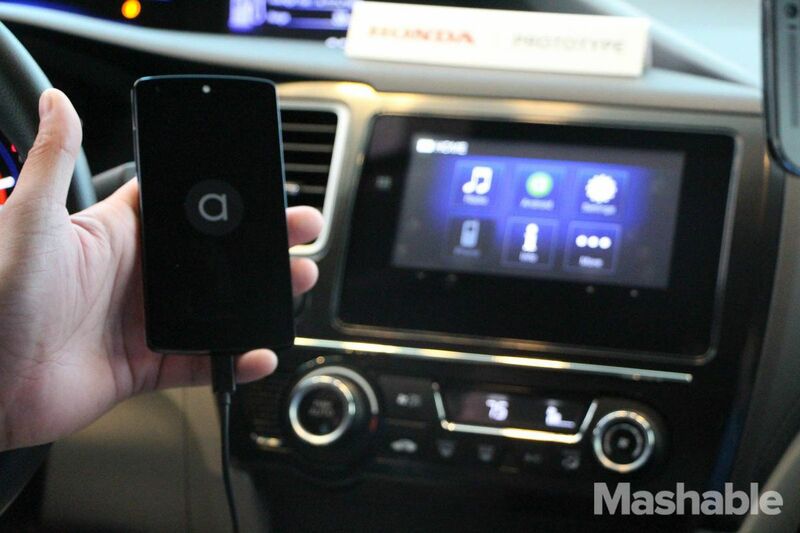 Android Auto is completely hands-free, and requires drivers to plug in their phone. The push into auto-focused software makes a lot of sense for Google. Americans spend more than 25 minutes each way on average driving to and from work. That’s a lot of time to be away from your always-on mobile device. Brady claims that 25% of accidents in the United States are caused by gadget use behind the wheel. Android Auto requires the user to plug their device into the car, and then go hands-free — a safer solution than looking down at your phone to pull up directions or make a call. 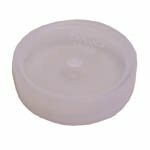 The connection isn’t wireless, which is somewhat surprising considering the prevalence of Bluetooth technology. But the physical connection does two things. It forces drivers to put their phones down, and it also creates a more reliable connection between phone and automobile. Once the phone is plugged in, a home screen pops up on the dashboard. The screen features five main tabs, such as Google Maps and Google Play Music. With Maps, users can tap the button on the screen or steering wheel, say their destination out loud, and the software will automatically determine the best route and begin the navigation process. This automation limits the need to fumble with buttons on the screen, a Google spokesperson told Mashable. With music, Google’s default player is Google Play Music, but the software supports other popular music apps like Spotify and Pandora, too. Drivers can tap the voice recognition button on the steering wheel and say a command — such as “Play Katy Perry on Spotify” — to pull up their music on the go. 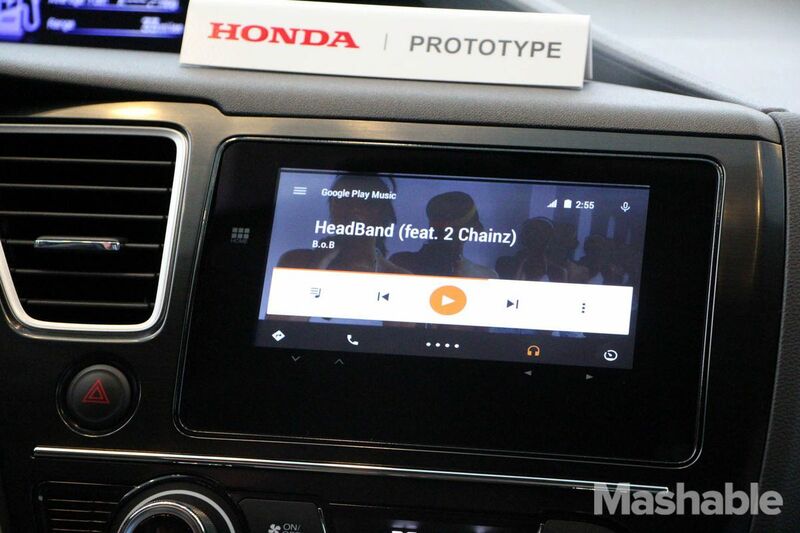 The Android Auto dashboard can play Google Play Music or other apps like Spotify and Pandora. The main home screen also offers a button intended to reveal mechanical information about the car, such as when you last changed your oil. The spokesperson said Google is working with manufacturers to determine what information can be shared, but the technology could offer drivers a safer driving experience by instantly identifying issues like a burnt out taillight or a leaking tire. Safety appears to be a major focus for Google with Android Auto. Voice search, for example, returns audible answers through the car speakers instead of appearing on the dashboard — another way to keep people from looking at a screen while driving. An auto version of Android offers major benefits for Google. There’s a wealth of information available in your car, it simply needs to be tapped. The data includes where you drive, what you listen to, what you search for while driving. It’s a glimpse into you as an individual, but also car owners in general. Bringing Android to the car also generates more user loyalty. As Wired points out, you own a car a lot longer than you do a phone. If your car runs Android, there’s less of a chance you’ll switch to iOS on your next contract. Android is far from alone in the connected car space. Apple also offers an in-car iOS experience known as CarPlay, and traditional manufacturers like BMW have their own systems as well. Android Auto simply benefits drivers who use an Android mobile device. There’s no date yet for when Android Auto will hit the road — although Google said at the I/O keynote to expect the technology in actual cars by the end of the year. A SDK for developer apps was also announced; that is not yet available either.